ETA Vic De Sousa. Photo Credit: All photos used in this post are credited to Trudy Taphorn, TCB Photography. 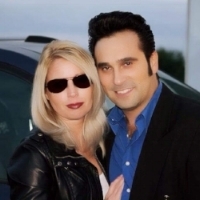 I wish to thank ETA and recording artist, Vic De Sousa, from St. Albert, Alberta, for sending his bio and photos to be posted on SIDEBURNS Magazine, and to congratulate him on his successes in the Amateur Division at the Penticton Elvis Festival, British Columbia, in four years of competition. Best regards, Carolyn MacArthur. ETA Vic De Sousa pictured with his lovely wife Geneieve Horvath. Let's just say that a young Vic De Sousa was mesmerized upon hearing that first musical note by the King. We can thank Vic's mom for introducing him to her Elvis collection. Vic quickly became intrigued with learning how to sing and portray the one and only Elvis Presley at a young age. He slicked back his hair, and quickly persuaded his parents to purchase a guitar for him so that he could sing and perform like Elvis. Vic is also an independent recording artist that fronts his own rock band called Stereo Villain (formerly De Sousa Drive). Stereo Villain's debut ep (extended play) CD was released July 2015. ETA Vic De Sousa. Photo Credit: Trudy Taphorn, TCB Photography. To date, Vic has released two ep CDs under De Sousa Drive, and one full length CD and ep under the name Sweet Alibi. Vic was born to entertain and feels very privileged to help keep the memory of The King of Rock and Roll alive in front of audiences everywhere. Vic has been a regular performer at Busby, Alberta, Blue Suede Music Festival (put on by TCB Rock and Roll Legends) since 2009. He performed in Puerto Vallarta, Mexico, with fellow ETA, and friend, Rob Knight, early in 2015. He filled in for his friend, Adam Fitzpatrick, on the Louisiana Hayrides in 2013, and just signed on for their 2018 spring tour. He placed in the top 5, and 3rd, in 2016, and placed 2nd for his division in 4 years of competition in the Penticton Elvis Festival. Whether he Is performing Elvis's music, or his own, the man who started rock and roll lives on at each and every one of Vic's performances. Elvis is in his heart and that of the audience.